Albert Bierstadt first traveled west in 1859 as part of a scientific expedition. Back in his New York studio, the artist translated his numerous sketches into monumental paintings, which he exhibited to great acclaim. This scene of Wyoming's Wind River Mountains, then in the Nebraska Territory, is typical of Bierstadt's paintings of the region: the natural setting, golden light, and vast open space appealed to mid century Americans’ expansionist spirit. The idyllic Native American encampment is the only obstacle to white settlement, which is evidenced by the plume of smoke from a hidden train in the distance. The train is perhaps a reference to the Pacific Railroad Act passed the year before this painting’s completion. Hassrick, Peter H., and Albert Bierstadt. Albert Bierstadt: Witness to a Changing West. 2018, color illus. p. 86, fig. 2.58. Rozema, Kelsey. 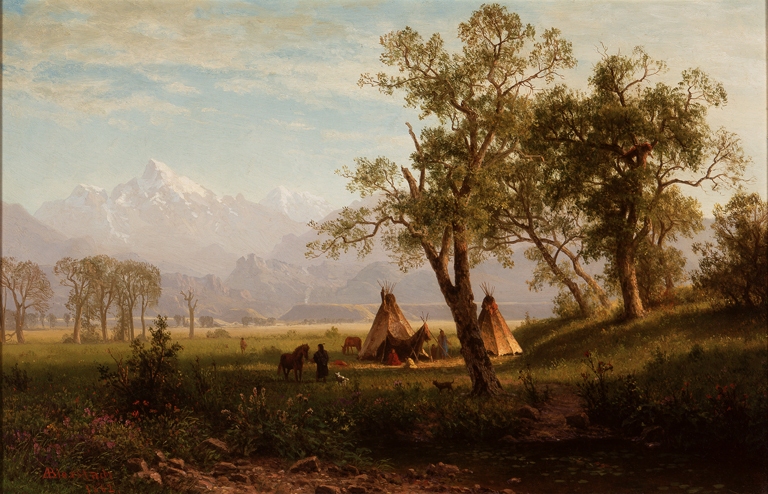 From the Collection: Albert Bierstadt’s Wind River Mountains, Nebraska Territory. Milwaukee Art Museum: Under the Wings, April 5, 2016. https://blog.mam.org/2016/04/05/from-the-collection-wind-river-mountains-nebraska-territory-by-albert-bierstadt/#more-13319. Eastberg, John C. and Eric Vogel. Layton’s Legacy: A Historic American Art Collection 1888 –2013. Milwaukee, Wisconsin: Layton Art Collection, Inc., 2013, pp. 130-31, 198-201, 223, 328, 458, color pl. 17, pp. 200–201, color illus. p. 131, color detail p. 199. Smith, Thomas B., and Chambers, Marlene. Elevating Western American Art Developing an Institute in the Cultural Capital of the Rockies. Denver Art Museum, 2012, color illus. p. 93. Kort, Pamela, and Max Hollein. I Like America: Fictions of the Wild West. München: Prestel, 2006, p. 169, pl. 123. Hassrick, Peter H. The American West: Out of Myth, Into Reality. Washington, D.C.: Trust for Museum Exhibition in association with the Mississippi Museum of Art, 2000, color pl. 41. Robotham, Tom. Albert Bierstadt. New York: Crescent Books, 1993, illus. p. 39. Goldstein, Rosalie, ed. Guide to the Permanent Collection. Milwaukee, Wisconsin: Milwaukee Art Museum, 1986, p. 107, b/w illus. p. 107. University of Wisconsin, Waukesha County. The World Lay All Before Them. Waukesha, Wisconsin: University of Wisconsin, Waukesha County, 1976, illus. cat. 2. Thompson, Paul E. 19th Century American Topographic Painters. Coral Gables, Florida: Lowe Art Museum, 1974, cat. 5, illus. p. 10. Hendricks, Gordon. Albert Bierstadt: Painter of the American West. New York: Harry N. Abrams, 1973 illus. p. 349 (CL-249). Mankind: The Magazine of Popular History 1, no. 12 (April 1969): color illus. p. 16. Nelson-Atkins Gallery of Art. The Last Frontier: An Exhibition of the Art of the Old West. Kansas City, Missouri: Nelson-Atkins Gallery of Art, 1957, p. 7, cat. 9. Hartmann, Sadakichi. Our American Art Museums: The Layton Art Gallery of Milwaukee. Arts & Decoration 5, no. 12 (October 1915): 466. Layton Art Gallery. Catalogue of the Layton Art Gallery. Milwaukee, Wisconsin: Layton Art Gallery, 1907. Pattison, James William. The Layton Art Gallery of Milwaukee. Brush and Pencil 3, no. 4 (January 1899): 205. Albert Bierstadt: Witness to a Changing West, Buffalo Bill Center of the West, Cody, WY, June 8-September 30, 2018, Gilcrease Museum, Tulsa, OK, November 3, 2018-February 10, 2019. I Like America, Schirn Kunsthalle, Frankfurt, Germany,September 27, 2006–January 7, 2007. The American West: Out of Myth, Into Reality, Mississippi Museum of Art, Jackson, February 19–June 6, 2000; Terra Museum of American Art, June 24–September 17, 2000; Toldeo Museum of Art, October 8–December 31, 2000. Albert Beirstadt: Art and Enterprise, Brooklyn Museum, February 8–May 6, 1991; The Fine Arts Museums of San Francisco, June 8–September 2, 1991; National Gallery of Art, Washington, DC, November 3, 1991–February 17, 1992. The World All Lay Before Them, Commons Art Gallery, University of Wisconsin, Waukesha County Campus, March 7–26, 1976. 19th Century American Topographic Painters, Lowe Art Museum, University of Miami, November 21, 1974–January 5, 1975. 150 Years of American Painting, John Nelson Bergstrom Art Center, Neenah, Wisconsin, November 25–Decenber 20, 1959. Beloit College Theodore Wright Art Center, September 13–October 28, 1959. The Last Frontier: An Exhibition of the Art of the Old West, Nelson-Atkins Gallery, Kansas City, Missouri, October–November 1957. 19th Century American Masters, Milwaukee Art Institute, Milwaukee, Wisconsin, February 20–March 28, 1948.